In order to better your time management skills and become the productivity powerhouse you were meant to be, consider adopting this 4-step strategy that allows you to plan every day, week, month, and year effectively. Create a to-do list every evening and every Sunday. In it, outline exactly what you need to get done in the upcoming period of work. Whether it’s a few short emails that need to be sent to nurture your business connections or an upcoming deadline on a 6-month behemoth project, write everything down, no matter the size. It doesn’t have to be high tech either, a simple pen and notepad will do the trick. If you do feel like going digital, use the note function on your phone or something connected to the cloud, such as Google Keep. Now that you have your tasklist in front of you, it’s time to sort them into the four different categories that will best enable you to prioritise them. Making sure you know which tasks are pressing and which can be pushed out by a few days or weeks will allow you to handle your workload with confidence. To sort your tasks, use the following technique design by Stephen Covey, author of 7 Habits of Highly Effective People. Once you have worked through your to-do list and answered those two questions for each assignment, categorising them into the four groups becomes easy. 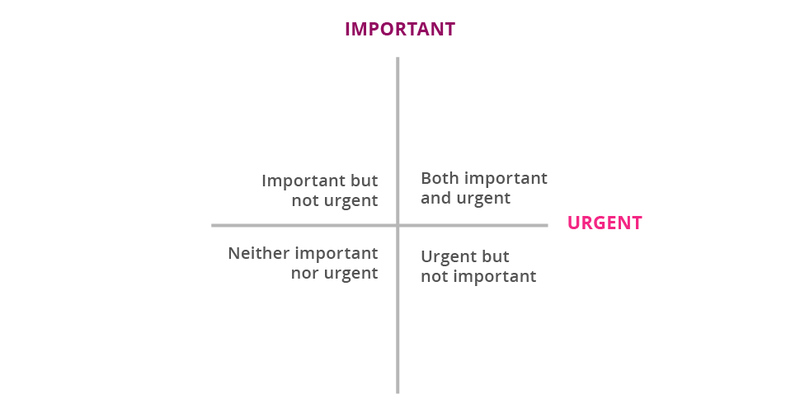 And, once categorised, your priorities become easier to identify. Deadlines force you to take your work seriously, and if you’re a person that thrives on pressure you can use the deadline stress to boost your productivity. To combat missing external deadlines, set yourself earlier internal due dates. And hold yourself to them. Expectations are nothing without accountability. This may seem obvious to many people, but the power of ticking things off on a to-do list is tremendous.